Browse: Home / Blog / 2012 / June / 19 / THE Facebook Plugin for WordPress? You may have seen last week that Facebook and Automattic jointly released a plugin called either “Facebook” or “Facebook for WordPress” (depending on who’s announcement you read). As someone who’s put a lot of work into two WordPress Facebook integration plugins (WPBook and WPBook Lite) over the last several years, I have to confess I had mixed emotions about the launch. On the one hand, it felt a bit like the proverbial 800lb gorilla had just sat on my head: how could we (I’m the lead developer but by no means the only contributor) compete with the combined development teams of Facebook and Automattic? Did they just make the plugins I’ve worked on redundant, or unnecessary? On the other hand, I’ll admit, I felt a bit of relief. Supporting a plugin like WPBook or its simpler cousin WPBook Lite is no easy task. There are many complex variations in how people have configured WordPress, there are many possible ways to configure a Facebook application, and both keep changing all the time. Just keeping up with the Facebook roadmap and the constant changes to their settings interface is a challenge. Combine that with sometimes less-than-grateful users and a full-time job (not to mention a life outside web development), and it’s quite tempting to just declare the WPBooks closed and move on. I think, however, there’s still a need (at least for now) for WPBook and WPBook Lite. WPBook provides a Canvas Page view of the blog as an application inside Facebook, as well as a Page Tab view. The new Facebook plugin for WordPress doesn’t do this (so far as I could see). With the exception of the first two items in this list (mention of friends and pages, separate messages for cross-posting), I’ve generally taken the approach that other plugins can do these other things, and keep the core of WPBook lighter – but then that does raise complications with conflicting Facebook libraries and such. I can see the appeal of an “all in one” type solution. It also seems (from looking through the code) that they’ve taken the approach of storing the access token per user, so different users could be cross-posting to different profiles and pages. I’m not sure if I prefer that or not, though I can see how a multiuser blog could want all authors to be able to post to one page but preserve their individual profiles. Finally, it seems they are one step ahead of me on the transition to removing “offline_access” – they automatically renew access tokens in the background, so that they never need to expire and alert the user. That’s a great approach and one I’ll steal leverage in the next release of WPBook and WPBook Lite. I’d love to hear from current, former, or prospective users of WPBook, WPBook Lite, and WordBooker, Steve Atty’s plugin which also does comment importing (and has a great many other interesting options) but uses one centralized Facebook application to simplify setup. (Honestly that’s what I expected Automattic and Facebook to do as well, but they still ask each user to set up a Facebook app). What do you all think of the new competitive landscape? 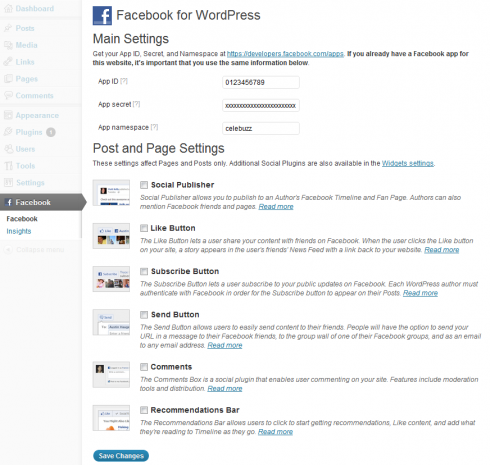 Does the entry of Facebook and Automattic change your decision about which plugin(s) to use?